The extinct carpoids are an informal grouping of Paleozoic fossils that closely resemble echinoderm, but lack radial symmetry. However, their classification remains controversial and they have been variously postulated to have been stem groups of other groups such as the basal deuterostomes or the craniates, tunicates, acraniates and chordates. Carpoids are known from the Middle Cambrian to Early Devonian. 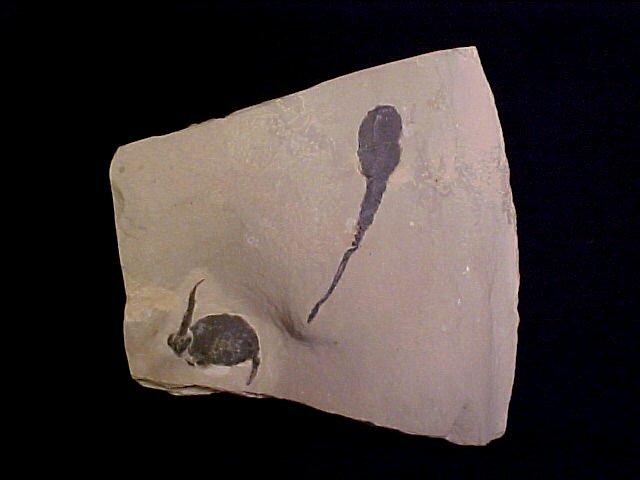 Coming from Utah’s Marjum Formation, this fine carpoid fossil dates to the Middle Cambrian when these animals first appeared. The pictures speak to strange asymmetric body plan of these enigmatic creatures. Interesting speculation about the problemmatic carpoids: Evolutionary biologists have been interested in external asymmetry as a measure of genetic quality. Research shows that animals choose their mates partly on the basis of symmetry. Animals increase their genetic contribution to the next generation when mates of higher genetic quality are chosen. More symmetry implies better genes and begets better prospects to pass on their genes, and so on. 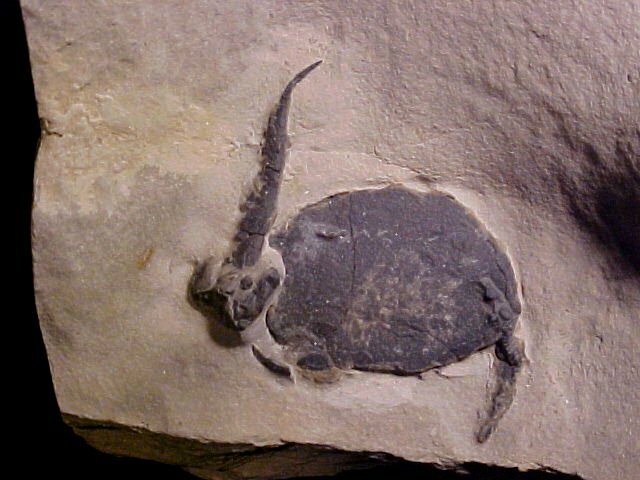 British paleontologist Richard Jefferies of the Natural History Museum in London has posited that a progenitor of all vertebrates suffered an evolutionary accident perhaps more than 600 million years ago, and that vertebrate evolution ever since has been a struggle to regain symmetry that has been only partially successful. The asymmetry of the internal organs within a symmetrical exterior of vertebrates is a retained manifestation of this accident that even 600 million years of selection has not eliminated. Jefferies, in part, bases his theory on studies of carpoids. These small strange creatures had spiny tails, bulbous heads and were covered with spines. Having a body supported by calcitic plates, they resemble modern echinoderms such as starfish and their relatives. Jefferies presents a compelling argument that the common ancestor of echinoderms and vertebrates was a carpoid, which is supported by the many shared features of echinoderms and vertebrate embryonic development. Carpoids are distinct from all other animals, extant and extinct, due to their complete asymmetry, both internal and external. The evolutionary body plan accident he hypothsizes would require it took place in a common ancestor of echinoderms and vertebrates. Carpoid's descendents retained the lop-sided external baud plan, but the echinoderms first, and the vertebrates later, were re-shaped through selection into animals with adhering externally at least to symmetry, while internal organs generally do not. 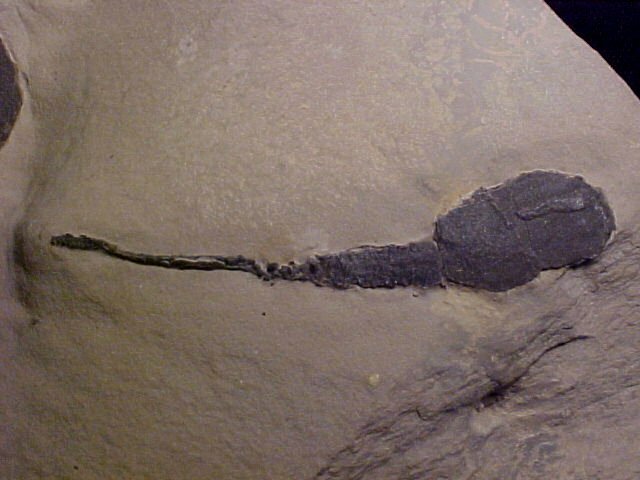 An intriguing theory – we’ll need to wait and see if now dirt cheap whole-genome sequencing-based modern phylogenetics of extant echinoderms can shed light on the shadowy period in the Precambrian when asymmetry appeared. Bromham LD, Degnan BM. Hemichordates and deuterostome evolution: robust molecular phylogenetic support for a hemichordate + echinoderm clade. Evol Dev. 1999 Nov-Dec;1(3):166-71.